Take the stress out of managing your health with the Chronic Illness Healing Binder!! Buy Here! Sometimes I am in the mood for a hearty salad. One that has good, clean protein, lots of veggies and a lot of flavor. This one has an added bonus of plenty of Omega 3’s. 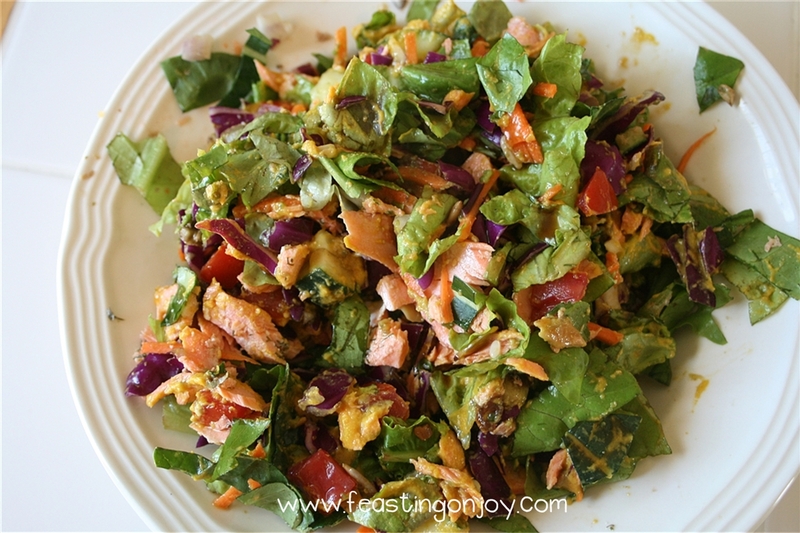 It is very easy to prepare and a good use of leftover salmon. I also love that almost every ingredient is something that you will have on hand in your stocked kitchen. 2 cups per serving of any mixture of organic lettuces or greens. (I used a mixture from our garden of kale, romaine, butter lettuce, purple cabbage and mixed green lettuce.) Chop into bite size pieces and combine them together. 1 recipe of Creamy Dairy-Free Salad Dressing from She Let Them Eat Cake written and linked below. Combine all salad ingredients in a big bowl. Top with flaked salmon. For the Dressing: Place all of the ingredients in your blender (you might want to chop your veggies first – depending on the strength of your Blender. If you have a Vitamix there is no need to chop the veggies.) Blend until creamy. If you find it too thick, add a bit more water. This dressing will taste even better the next day! Enjoy this refreshing salad on a hot summer day. It is full of omega 3’s, antioxidants, good fats and will make you feel energized! Welcome to Feasting On Joy where thousands of women are learning to take their life back holistically with God-given gifts! My name is Jennifer and I am thrilled you stopped by. Grab a cup of tea and stay awhile with me. I want you to know that you can feel amazing every day physically, mentally and emotionally! It’s my biggest joy to help you move from merely surviving your life and just getting through it, to thriving and loving every part of it!